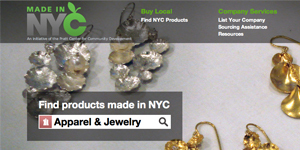 Promoting yourself as a local business just got easier with the Made in NYC database. Created by the Pratt Center for Community Development, their mission is to support the manufacturing sector; an ecosystem of over 7,000 small manufactures that employ 65,000 people throughout the boroughs. Their free database includes a listing of emerging designers, food, fashion and furnishing companies that are helping to fuel the local economy, provide jobs and sustain the city's infrastructure. The benefits include finding other suppliers and also the use of the Made in NYC logo. For consumers, it's a way to support entrepreneurs by shopping local. Manufacture or contract to a manufacturer that is engaged in the essential product transformation within the five boroughs of New York City. Once you submit to Made in NYC, they will contact you to verify details. Register your business and learn more at Made in NYC.